What is Coriolis Mass Flowmeter ? Coriolis Mass Flowmeter is measured by the principle of Coriolis force that is proportional to the mass flow when the fluid flows through the vibrating tube. 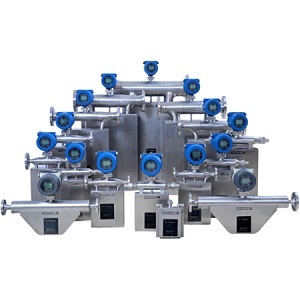 Because it realizes the high-precision direct flow measurement, it has many advantages such as anti-wear, anti-corrosion, measurable multiple media and multiple parameters, and is now widely used in petrochemical, pharmaceutical, food and other industrial processes application. Coriolis mass flowmeters are accurate, stable, and reliable. They are used in many occasions where accurate measurement or control of fluids is required, but Coriolis mass flow meter price is high. Other mass flowmeters are generally used where precise metering and control are not required. Coriolis meters are available for both liquids and gases flow measurement, but in field applications, thermal mass flow meters are typically used for accurate measurement of hydrogen flow. The choice of Coriolis flowmeters is generally based on their performance and reliability. Performance includes various factors such as accuracy, flow range, pressure loss. What is the Advantage of the Coriolis Flow meter ? (1) Real, high precision direct mass flow measurement is achieved. The accuracy is generally 0.1% to 0.2%, and the repeatability is better than 0.1%. (2) It can measure a variety of media, such as oil, chemical media, papermaking black liquor, paddles and natural gas, it can be used as asphalt mass flow meter，molasses flow meters，syrup flow meters, glucose flow meter, slurry flow meter and so on. (3) The characteristics of the medium density, viscosity, temperature, pressure, conductivity, and velocity of the fluid have little effect on the measurement results. (4) No moving parts, no obstacles in the flow tube, easy to maintain. What we need to know when install Coriolis mass flow meter ? (1) The sensor and transmitter are matched and calibrated before leaving the factory, and must be matched one by one during installation. If the transmitter is replaced and there is no re-calibration, although the system parameters can be run by re-inputting the configuration, but some system errors may occur. (2) Sensors, transmitters and cables should be installed to avoid electromagnetic interference, such as away from large motors and relays. (4) In order to ensure that the fluid passes through the vibrating tube uniformly, the mass flow sensor should be installed before the throttling device, the choke element, or after a straight pipe length of a certain length. (5) The support flange must be installed with sufficient rigidity and quality at the length of 6~10 times of the pipe flange before and after the sensor flange, and the support must be reliably fixed with the pipeline to avoid the vibration of the pipe disturbing the vibration of the vibration pipe and cause measurement error. (6) The sensor and the pipe should be coaxially aligned during installation, and should be installed as stress-free as possible, whether axial or radial. In summary, the Coriolis mass flowmeter is a new type of flow measurement instrument; it has some advantages that other flowmeters do not have. The measurement accuracy is only related to the sensor's detection time difference signal, so it is getting more and more in many fields. However, the use of environmental vibrations should not be too large, and the design and installation should be properly designed. Silver Automation Instruments supplies cheap price Coriolis mass flow meter from China qualified factories with low price and robust construction. Welcome to contact us to obtain the price cost of the China flow meters.